Is a premium latex liquid additive in concentrate form. Formulated to increase bond strength for non-polymer modified grouts, and all Portland cement mortars. 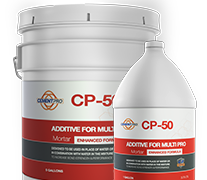 Ready to use in liquid form and can be used in place of water or in combination with water in the mixture to increase performance and bond strength of the MULTI PRO non-polymer modified grouts and all Portland cement mortar mixes. Use with setting impervious porcelain tile, glass or when higher bond strength is needed. Use when setting impervious porcelain tile over exterior grade plywood,glass or when higher bond strength is needed. Can applied for use in interior and exterior floors, walls, countertops, existing ceramic tile, vinyl, plastic laminates, etc., when increased tensile and flexural strength are required in an unmodified tile grout.